I tend to keep the automotive content on this site to a minimum. I don’t think making an automotive analogy to all things Sweetie would always work out. I know I put a disclaimer that I would not have a bunch of pictures of her in the garage or hanging on the project car, but this is different. A couple of weekends back the weather was perfect and I decided that Wife, Sweetie and I were going to a car show. With the busy summer I have not been to a single show and Sweetie was bound to attend one eventually. The Lake Michigan Region chapter of Lambda Car Club International was hosting their national meet and part of the events included a show at their host hotel. I knew it would work out. I met the chapter president, Eric, shortly after moving to the shop in the Lakeview neighborhood. 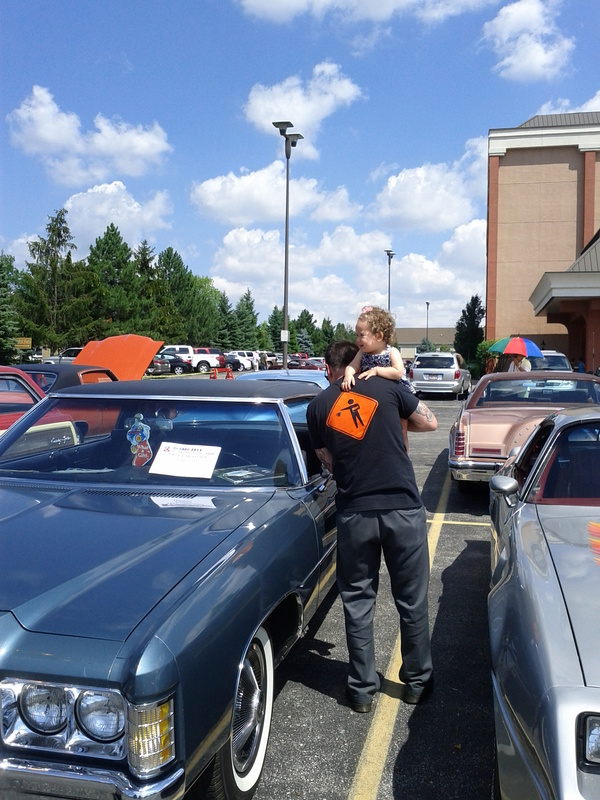 We worked out a deal where the club used the shop lot for their annual car show. After three successful shows we established a working relationship that now carries outside the shop setting. They just had their fourth car show at the shop in June and the connection still looks strong. The members of the LCC-LMR tend to have original and restored cars, many (but not all) from the 60’s and 70’s. Their cars also tend to have interesting stories: custom carriage work, barn finds, Detroit connections. Body shop – car club – from the start the relationship made sense to me. And so off we went! The site was only a short drive west of the city and as I mentioned (as you can see in the pics) the weather was great. The show took up the front two parking lots of the hotel, but there were not so many cars that was overwhelming. Again, most of the cars were original or restored, but there were a couple of customs to catch my interest. Sweetie was cruising around in her stroller saying “Hi!” to everyone and Wife even spotted a couple of rides that she would like to add to the garage. Probably the most striking car (to me) was a metallic grey, 1967 Lincoln Continental convertible that had been in the owner’s family since his father bought it new in 1967. So insert picture here and kick myself for not snapping one to put in the entry. There were also two 1914 Fords that were driven from Detroit to Chicago for the invitational. That owner said it was a great, albeit slow, drive. There were about a hundred cars and I think I counted five trailers behind the hotel. In my opinion, the fact that the majority of the cars were driven to the invitational just adds cool points. Oh, a special thanks to Eric and Larry and the guys from the LCC-LMR. (That’s Eric’s 1971 Chevy Caprice in the pictures. Formerly a Detroit Factory Manager’s car, it is a factory big block, options-loaded, all original driver. )They have always been cool with me, even though some of our car tastes differ (I am more into customs than originals). They don’t bust my chops because they hear about my project but never see it. And they have always been welcoming to Wife. Of course they were great to Sweetie, who they had heard about through the blog but not yet met. If you get a chance to check out one of their shows and see some of their cars you should. 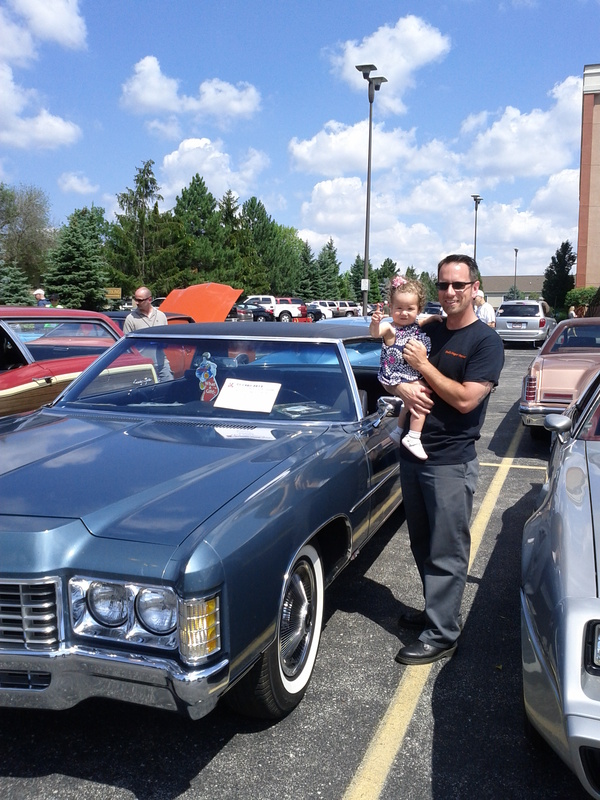 This entry was posted in Hot Rod Lullaby and tagged baby life, car shows, chicago, classic cars, customs cars, family activities, Stay-at-home Dad. Bookmark the permalink.